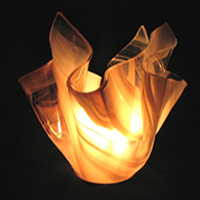 We specialize in a wide variety of unique glass pieces that include our famous Olive Oil Lamps. Our line of unique Olive Oil Lamps are perfect for everything from a housewarming gift to a wedding gift. They are a perfect piece of functioning art glass. We carry a wide variety of colors, so if you are looking for a centerpiece idea that fits into home or wedding reception decoration, please feel free to email us your color and we can send you photo's of what we can do to compliment your reception. As always, we contine to produce our beautiful line of stained art glass offering custom Tiffany Stained Glass Lamp reproductions, stained glass panels, stained glass windows and mosaics. 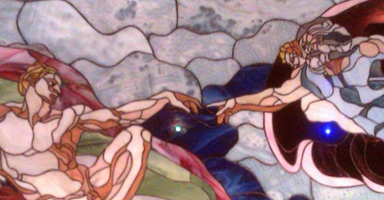 We offer most aspects of custom stained glass, custom cut beveled glass art and hot art glass work. Born from Christman Stained Glass, which began in 1979, we offer high quality handmade glass art.